Henry Kovalcik couldn’t understate it more. As co-director of AITS and one of the members of the building task force committee (BTC) for the new Engineering and Computer Science (ENCS) building, Kovalcik is a witness to the immensity of moving people, equipment and furniture into the facility. The complexity of it is staggering. Kovalcik and the BTC must coordinate with professors, students, building contractors and the moving company, all while considering very real time limits, such as expiring leases and the upcoming school year. In order to accomplish their goal of moving in by the end of July, the BTC took great pains to be organized and stay ahead. In July 2004, an online database was established to track the ENCS inventory. By April of this year that database was complete, with every piece of furniture and equipment bar-coded and accounted for. During the inventory process, the architects added the equipment to the floor plans, while purchasing decisions were made to replace or add to the existing equipment. 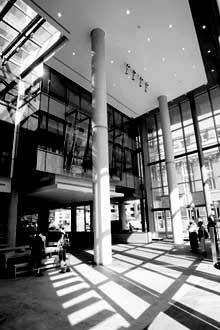 The main lobby of the building at Guy and Ste. Catherine Sts.is awash in sunlight. There are remarkable views of Montreal from the building on all sides, thanks to the glass walls. The moves started in mid-April, according to BTC member Guy Gosselin, and each one was a learning experience. “There’s a flow,” Gosselin said. “You stop the operation in the lab, you start packing, you move things out, you bring it here.” The evidence can be found two floors below street level in the new building, where the “heavy labs” are located. At the far end of the floor is a room which houses the 17-metre-long wind tunnel. It certainly didn’t just come in through the door. On the contrary, Gosselin and his team had to cut open three walls to move the tunnel’s parts from the building’s permanent interior crane to its current location. They were lucky, as they only had to knock out some gyprock and cut some electrical conduits, some of which were emergency circuits feeding other parts of the building. If there had been compressed air or gas lines, things would have become substantially more complicated. The wind tunnel move and Gosselin’s dry assessment of it indicate how unpredictably challenges arise and how routinely they are dealt with. Down the hall from the wind tunnel is a “vibration pit” filled with several 10,000-pound iron plates, moved in one at a time. Next to that is the water flume, a heavy, fragile, odd-shaped steel and plexiglass device used to test water flow. They managed to move that without bending it. Many hazardous materials come from the labs. Separate arrangements, outlined on a BTC website dedicated to the move, were made for chemical, biological and radioactive materials, as well as for lab animals. Third parties were hired in some cases to oversee their handling. For instance, after staff and students organized their materials, a chemist was hired to segregate and pack chemicals so the move could take place safely. To facilitate planning and scheduling, all moves were slated to take place on Mondays, Tuesdays and Wednesdays, with unpacking to take place during the rest of the week. While some of the moves have been delayed due to unfinished construction, most have gone according to schedule. Kovalcik is sympathetic with those who had to wait. “Professors are very concerned about their work, whether it’s research or contract work, which has deadlines. And here we are asking them to move. “So we shut them down, based on our initial moving schedule, they pack up a place. And then we find out we can’t move them because the destination’s not ready. They’re all packed up, and now what do you do? To complicate things further, moving has started in the Visual Arts building. Not only do the buildings have to share a loading dock, they also have to share Montréal Express, the company hired to do the moves and supply the packing materials. When it is all over, Gosselin, Kovalcik and the rest of the BTC will have condensed 14 civic addresses into 18 floors totalling over 21,000 square metres. They will also have added $1.2 million worth of new furniture, $500,000 of new computers and $500,000 of new audiovisual equipment. They’re hoping they can get it all done on time. “In six months, we’ll laugh about it,” Kovalcik said.